Lisa Lewis' unique prints are inspired by a tree she used to climb as a child. She inked a cross section of that beloved tree and hand printed its organic image, preserving the concentric rings and textures that held so many happy memories of childhood. 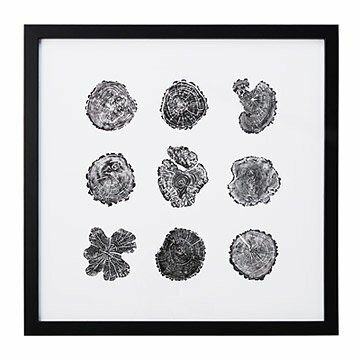 Following the same natural relief technique, these prints are made from a series of salvaged trees with their own unique shapes and histories. The original relief images are faithfully reproduced in a digital print with optional framing. Made in Utah.